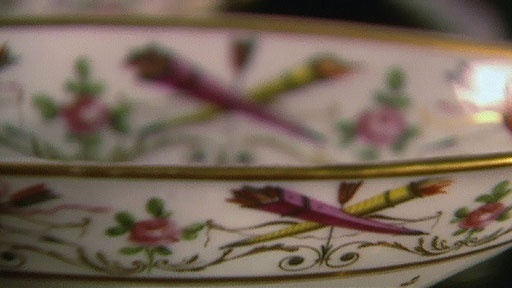 Hearts and arrows blaze across an unusual set of china at the Powel House in Philadelphia. Philadelphia, called "The Athens of America," was in the 1770s the most important city in the colonies. And when in Philadelphia, Powel House was the place to be. Elizabeth and Samuel Powel lived there, and the likes of Washington, Jefferson, Adams, and Franklin socialized there. Family legend claims the Marquis de Lafayette, the French general who helped free the American colonies, gave the set to Elizabeth Willing, the popular wife of the Patriot Mayor. The History Detectives look into the facts and fiction behind this racy 18th century gift. Also in Season 1 Whaling Ship Might a ship docked in Mystic Seaport, hold secrets to the Underground Railroad? Also with Elyse Luray Birth Control Box Could this unusual wooden box be an early contraceptive device? Also with Elyse Luray Mexican Currency What role did this money play in the Mexican Revolution? Related Investigation Napolean's Sword Did Napoleon bestow this sword as a gift to a brave ancestor of a St. Martinville family? Also in Revolution: 1754-1820 Kittery Telescope What can this telescope reveal about America’s earliest struggles for independence?